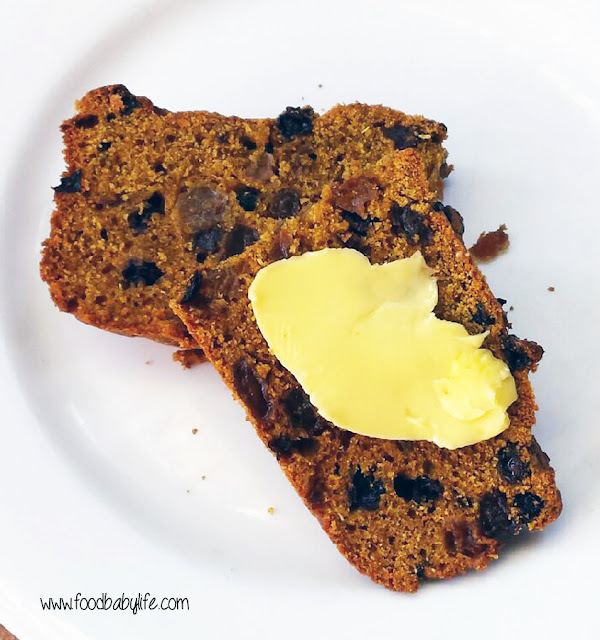 We're going old school with this one - and it doesn't get much more retro than a boiled fruit cake! I know not everyone is a fan of fruit cake but we love them. They are very much a treat in this house though as being full of dried fruit they are also packed with sugar. I still had half a bag of mixed dried fruit leftover from making Christmas cakes and a visitor coming for morning tea so it seemed like to the perfect opportunity to make this again. It is adapted from an old family recipe that I can remember my mum making in the 80s (yep I'm that old!). It is has no sweetener apart from the dried fruit (tick), wholemeal flour (tick) and mashed pumpkin (big tick for hidden veggies). The pumpkin gives it a lovely warm colour and helps keep it moist, although unlike other fruitcakes this one is best eaten on the day or the day after baking but no longer. Even my pumpkin-hating husband and super fussy Mr 5 loved this and the entire cake was demolished between 6 of us. Place the fruit, butter, water and spice into a large pot and bring to the boil over medium high heat. Let bubble for 5-10 minutes or until most of the liquid is gone and the fruit is plump and sticky. Allow to cool completely. Preheat the oven to 170 degrees C / 150 degrees fan-forced. Grease and line a deep 8 inch cake pan and set aside. Add the beaten egg and pumpkin and mix well. Fold through the flour and baking powder (I never bother sifting but you can whisk them together in a bowl before adding if you like). Pour the mixture into the prepared tin and bake for approximately 1 1/2 hours. Watch the top and cover with foil if it is getting too dark. Cool in the tin and serve sliced with butter and a cup of tea.